Former US President exchanges views with young leaders in Berlin. Barack Obama and Hertie School students Raúl Carbajosa Niehoff and Ilan Masson. Hertie School student volunteers Isaac Ward-Fineman, Katherine Tepper, Julius Kerkhoff, Bianca Neumaier, Mufaddal Tambawala, Victor Ortiz Rivera, Ana Cristina Perez de La Paz Prieto, Raúl Carbajosa Niehoff, Ilan Masson and Agustin Roth. Hertie School MPP graduate Daniel Gyamerah asks Obama his question. Raúl Carbajosa Niehoff, Katherine Tepper, Ashley Branton-Bamford and Daniel Gyamerah. Former US President Barack Obama spent time during his Germany tour with international students in Berlin on 6 April. Ten Hertie School of Governance students and several alumni attended a Town Hall event at the European School of Management and Technology, where Obama spoke to an audience of 320 young European leaders from 37 countries. 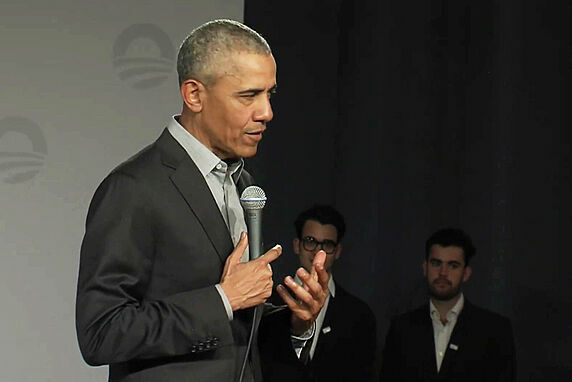 The former president toured Germany this week to promote the Obama Foundation’s work in supporting young people to become actively engaged in tackling problems facing the world today.